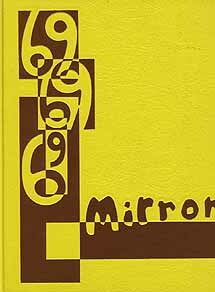 Now everything you wanted to know about the IHS Class of 1969 is at your fingertips...as published in the 1969 Mirror Class History. Mary Erin (O'Connor) Blair is featured in the November 2016 Cover Story. 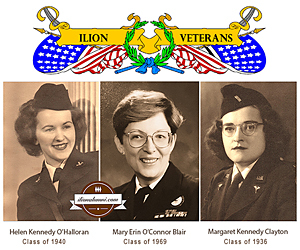 During this historic year, take time to salute Ilion High School's Outstanding Women Veterans on Veterans Day. "I graduated from Ilion High School in 1969. I'm looking for a 1969 yearbook or copies of the senior pictures from that year. (my senior yearbook seems to have come up missing.)" Harold Pierce, email. - Can anybody help? 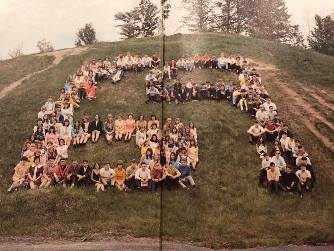 "This year will be the Class of '69's 40th class reunion. So far nothing has been planned which is no big surprise." "On July 17th, Friday night, The Boss V reunion band will be playing at the Elk's Club following the 2009 Ilion Days Doo Dah Parade. This could be a prime time for those Class of '69 graduates to get together and have a drink or two, hang out, and see who comes." Petrina Keddell Hamm '91, sent news regarding the Leukemia & Lymphoma Society's Team in Training. "Guess what? My husband, Jon, and I have decided to run a marathon! Yes, you are reading this right - on October 21, we're going to run the Nike Marathon in San Francisco. The good news is that you don't have to - but you can help! We've joined the Leukemia & Lymphoma Society's Team in Training to help raise funds for leukemia & lymphoma research. As a Team in Training member, we have accepted two important challenges- to prepare to endure a marathon and, more importantly, to support the fight against blood cancers by each raising $4000 to benefit the Leukemia & Lymphoma Society." "By joining Team in Training, we have committed ourselves to a summer full of learning how to run and of raising money for a cause that we truly believe in. Personally, our race is inspired by an amazing individual who is currently battling cancer: Paul Keddell, Sr. (Petrina's uncle, a 1969 IHS graduate). As some of youknow, Paul was diagnosed with multiple myeloma in May of 2006. [He has a website, made by his daughers: caringbridge.com/visit/paulkeddell. Please keep Paul in your prayers.] Knowing of the fight he is fighting -each and every day- and the tremendous spirit & courage that is carrying him is our motivation to run." This run will be a labor of love for both of us. Please support us and the Leukemia & Lymphoma Society by sending a tax-deductible donation by August 1st. In doing so, you will be supporting the Leukemia & Lymphoma Society's vital mission to finding a cure. You can mail a donation to us at 600 Brickstone Drive, Apex, NC 27502. Please make sure checks are made payable to the Leukemia & Lymphoma Society. Alternatively, you may donate by credit card at my website:www.active.com/donate/tntenc/phamm. You can also check this site for regular updates on our training and fundraising progress. Please keep in mind our fundraising deadline is August 1st. If you or someone you know has had their life touched by cancer, please feel freeto write their name on the enclosed donation form and and send it along with theirdonation. Or, if you're sending a donation using my website, feel free to email the name to me. We would be honored to write these names on individual ribbons and pin them to our jerseys on race day, running in tribute to their struggles, strength, hope and memory as well. The American Cancer Society at www.cancer.org. The Col. Arthur Forbis Chapter, NCSDAR (Daughters of the American Revolution), c/o Bettye Milligan, treasurer, 4307 Golden Eagle Way, Greensboro, N.C., 27410. Mr. Mark Vivyan, IHS 1969 and Faculty Member, 59, of Ilion, passed away on January 8, 2011, at Faxton-St. Luke's, with his loving family by his side. Mark was born in Ilion on March 29, 1951, the son of Gordon (Jim) and Margaret (Wright) Vivyan. He was educated in Ilion Schools and was a graduate of Oneonta State Teacher's College. 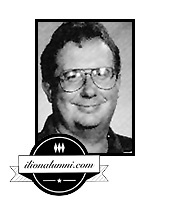 Mark was a social studies teacher in Ilion until his retirement in 2006. Mark was an avid sports fan who enjoyed both playing and coaching, especially baseball and basketball. Mark once played for the Milford Macs. Most recently, Mark enjoyed golfing and working at Hidden Valley Golf Club in Whitesboro, where he had many friends. Mark was also a member of the Ilion Elks #1444 and was co-owner of Treasures in Herkimer. Barbara J. (Deyle) White, Class of 1969 and IHS Secretary, age 51, of 39 Montgomery St., Ilion, passed away Saturday, December 14, 2002, at Faxton Hospital, Utica. Barb was born January 26, 1951, in Ilion, the daughter of Frank E. and Winifred (Fritzie) Flock Deyle. On July 30, 1983, she married Joseph White in Ilion. Barb was a graduate of Ilion High School and Mohawk Valley Community College. She was employed as a secretary at the Ilion High School. 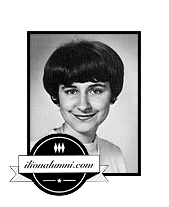 Gale Andrews Ahern, 47, IHS 1969, died Friday, April 2, 1999, after a courageous battle with leukemia. Gale was born August 16, 1951, in Herkimer. She was the daughter of Edward and Shirley Gale Andrews. She graduated from Ilion High School in 1969. Gale earned a bachelor's degree in biblical education from Alaska Bible College in Glennallen, Alaska. She married John Ahern on April 7, 1979, in Little Falls, NY. She was a staff member at the Ilion Free Public Library. 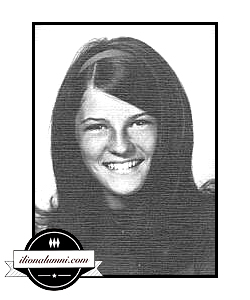 "Just wondering if anyone knows how to get in touch with Donna Kennedy, Class of '69 just to let her know about the Boss V reunion on 7/16/09 at the Elks Club.........."
"My sister just notified me of this site. WOW! I wish I had known of that mega-reunion a few years back. Now I won't miss the next one. I see a lot of familiar names; sad to see how many are gone. I got my BS in Medical Technology from Virginia Commonwealth University, and I work at the So AZ Veteran's Hospital lab here in Tucson. Divorced, no kids. Hi to everyone in Ilion and the Class of '69!!!!!!!!!!" "In Ilion. Divorced mom of three, grandmother of 6, would love to hear from anyone in the class of '69." "Just found out about this site from a friend in Newport Rhode island! Go figure. Sad to read news of 1969 graduates who has passed away. Saying hello to all who see this!" "I have resided here in Charleston,SC for 9 years now...my daughter Melissa Dodson resides not to far away...I am still working the our Corporate Office for Intercontinental Hotels Group...I enjoy my job tremendously and hope to retire from here in a few years...I'd love to here from former classmates...."
"I am currently working at MetLife in the New Hartford Business Park. My three daughters are continuing to get older, thus I am realizing I am too. Carrie is 25, Terrie 23, and Maggie will soon be 15. Carrie and Terrie had their little ones in 2000 and 2001 Charity is Carrie's daughter, she is 17 months old and Terrie's daughter, Adah, is 10 months old. They are the cutest. We just currently moved back to Ilion and are very glad to be attending the Mega-reunion in October." "Hello to all. Things have been going along. I'm still with the Canal - Electrical Supvr. in the Utica section. Mike Jr. is in the Navy, and Pat has the rest of this year to go. Hope to see you all real soon. PROF 69"
"I just love this page. Every school should start one. I'll be in touch. E-mail me class of 69. I'm married to Michael Sciortino for 23 years. Four children: Lisa,17 Matt,16 Jessica,14 & Mikey,10. I really enjoyed visiting this website. Today was the first attempt at finding it. Every school should think about creating one to keep up with everyone." Dale Reed Ritton, Ilion, NY, email, the third alumnus from the Class of 1969 to register in the alumni directory. Sue wrote "....I worked for Ilion PD for about 8 years and have been away for about 9 years. I don't get home as often as I want to but...it's great to see Ilion on the web..I just got done talking with Tony Licari and said Ilion had a webpage..so I did some searching... My mom still lives on East North Street and my brother Jeffrey just moved to long island at Christmas time..hope to hear from you..I have to go back and check the hp because I want to be home for the Ilion days week-end! Oh by the way I'm not that far way just in Albany!! my best to all!!! Sue (Coffin) Walsh."